Conferences come in all varieties and cover a wide range of interests. Whether it’s your favorite hobby or a professional interest, there’s probably a conference (and maybe even an app!!) for that. No matter the conference, they are designed to provide its attendees with learning experiences and networking opportunities. So when asked “Why genealogy conferences?” my short answer is learning and networking. Truth be told, I am still fairly new to the genealogy world. I have only been working on my genealogy for about six years, but a few of those years genealogy was a daily occurrence. I am by no means an expert and I still have things to learn. While I take advantage of books, journals/magazines, webinars, and local programs to continue my genealogy education, I find that conferences offer so much more. First, they are usually multi-day events, and it gives me an opportunity to immerse myself completely in genealogy for those few days…an escape from real life, and hey, we all need that every once in awhile. I can attend sessions to learn about records and methodology and I can visit with vendors in the exhibit hall to explore various products. Most importantly, I’m surrounded by people with the same interests and passions, which always makes for great conversation and networking. Of course I can read a book or attend a webinar on a topic, explore a software provider’s website, and even hang out with genealogy buddies on Facebook, but it’s not the same as the face-to-face interaction I experience at a conference. This is why, for me at least, I look forward to attending genealogy conferences. Where else can you talk about great-aunt Frieda for three or four days straight without anyone running away shouting “save me” or falling asleep from boredom? I am really looking forward to attending the Federation of Genealogical Societies (FGS) 2013 Conference this August (it’s been on my calendar since 2011!!). Honestly, location has a lot to do with why I am attending this particular conference to fulfill my one-conference-a-year quota. It’s being held in Fort Wayne, Indiana, which is within driving distance for me, and I have never been to Fort Wayne, which is home to one of the largest genealogy collections around—Allen County Public Library (ACPL). Beyond location, I attended the FGS 2011 Conference in Springfield, Illinois, and had a spectacular time (it was also my first national genealogy conference). The speakers were great, the atmosphere was wonderful, and I met a lot of fantastic people. I’ve been to other national conferences since then, and so far, FGS takes the cake! Of course I’m looking forward to the learning and networking opportunities as well. In fact, the day the session schedule was released, I added all of the sessions I want to attend to my calendar (I know, obsess much?). I am particularly thrilled that Elizabeth Shown Mills will be presenting at FGS 2013, as I have never attended one of her lectures and am looking forward to that experience…maybe she’ll sign my copy of Evidence Explained…. I am also looking forward to meeting “in person” genealogy friends I have come to know over the years through social media outlets such as Facebook and Twitter. I also can’t wait to see the many friends I have met at genealogy events in the past and play catch-up. I really am bubbling over with excitement as I write this post, but disappointed that the conference is still three months away! Oh well, I guess that means more time to develop my research plans for the ACPL while I’m in town a few days before the conference! 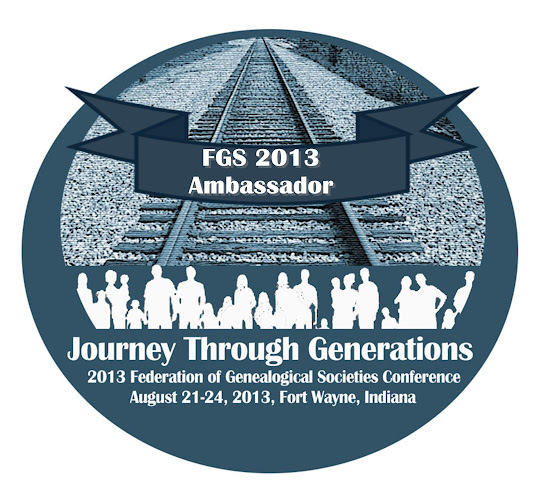 Will you be at the FGS 2013 Conference? Maybe we could meet up! Drop me a line in the comments or via email if you prefer. This post was written for the April/May Ambassador Blogging Prompt as part of the FGS 2013 Conference Ambassador Program.